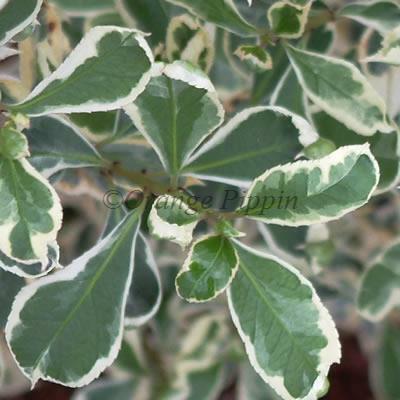 Rhamnus alaternus 'Argenteovariegata' is a large, bushy evergreen shrub with small, but very striking, greyish-green leaves with creamy-white margins. Tiny yellow flowers are borne in late spring and early summer, followed by small red berries which turn black as they ripen. This attractive shrub will thrive in most soils, in sun or partial shade. It would add interest within the mixed shrub bed or border and is good for coastal planting, provided shelter from cold or exposed areas is in place. It is drought tolerant, so easy to grow, but once planted it does not like being moved.